events...What we really want is to spend time together as women having fun, encouraging one another - and doing a variety of things (I like variety - even on walks and in coffee shops!). It's going to be a great evening! 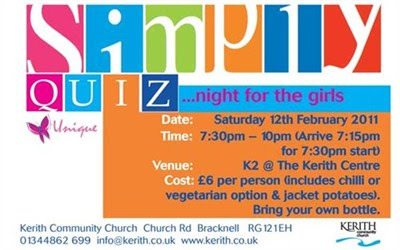 Ruth is organising this event, and she's got a fab team including the best quiz-master in town, and some great men to cook for us! Come on your own or in pairs, 3's etc and we'll get you in a team, or come as a team of 7! This is a brilliant event to bring friends, sisters, colleagues, neighbours, new people etc. It's a great evening to spend time with old friends and make new friends . It's just going to be FUN (and competitive?!) so get inviting, get planning, and get your tickets! Keep up to date with the Simply Quiz on the Kerith website and on the Simply Quiz Facebook page.